Every event you attend is awesome, but not every event will ignite or reignite the fire in you to give birth to your God given dreams. 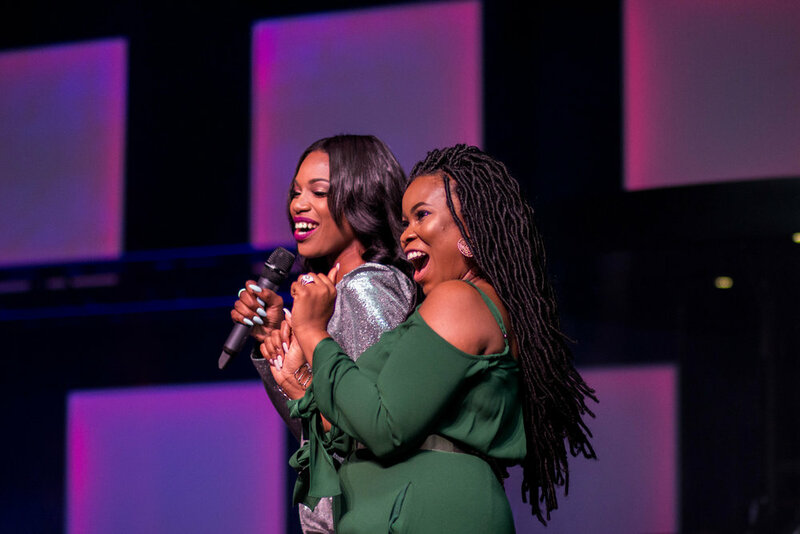 Women who attended the Woman of Purpose Conference came expectant because to attend this conference means you're ambitious, passionate, and you have a desire to unlock the power and purpose within you. The women who attended made an investment in themselves to become a REINVENTED WOMAN by the end of the conference. It was so amazing to see fear destroyed, confidence restored and dreams truly coming to life. The Woman of Purpose Conference is designed to empower, equip and lead women to pursue their God given passions and dreams. We gather entrepreneurial and business minded women, provide them with resources, connect them with mentors and create an atmosphere for women to thrive. Major Key to attending the Woman of Purpose Conference 2017: Keep an open heart and an open mind, be present, and be expectant. Jessica Chinyelu, Founder of WOP kicked off the conference by stating, "September 22nd marks a new season! This season is Fall and it represents harvest. Everything you ladies have worked so hard for the past few seasons; this is your time to gather your crops and reap everything you've sown." This two day life changing event was the 3rd Annual conference for Woman of Purpose. Women traveled from all over the world to attend and it was definitely full of successful, business-saavy Jesus lovers. Whether you were looking to develop a closer relationship with God, discover your calling, learn how to profit from your gifts, get relationship advice or the do's and don'ts in networking; there's no way you could walk away from this conference the same way you came. Women poured out their hearts as Jonathan Traylor and One1Way band led us into worship the first night. Then we heard a powerful testimony from Obia Ewah, Founder & CEO of Obia Naturals. Her story was so touching! She shared how sickness, failure and closed doors can actually lead to greatness. Panels are always fun and great way to learn from speakers with diverse viewpoints. Viema Perez served as the moderator for the panel and it featured Rachel L. Proctor, Dr. Margaret Ellis, Lizzy O. (The DIY Lady), and Jokotade. There were so many questions asked and the women on the panel gave loads of wisdom. You can get exclusive access to watch the panel HERE. You MUST understand human limitations. In other words, trust in no one but GOD. You MUST get quiet and remove yourself from all the noise. Make the LORD your #1 priority. Now this is just a small taste of what Jokotade taught us, but it was one mind blowing presentation. ..... And the fun continued with powerful Ted Talk style sessions from Jackie Nwobu, Founder and Editor-in-Chief of Munaluchi Bridal Magazine, Stacy Ike, host of OWN Tonight, and Yvonne Orji (known as Molly on the hit show Insecure). Here's a snippet of what each influencer had to say about owning your influence. Throughout the conference, storytelling seemed to be a major part of the conference. Queen Smith captured the audience's attention by encouraging us not to be afraid of changing our narratives. And we can't forget about Dominique Broadway, Founder of Finances De•mys•ti•fied who taught us about the importance of understanding our finances and the beginning stages of investing money. Nkem Okafor, Jennifer Onwumere, Obia Ewah, and Chioma Nwogu Johnson dropped nuggets of diamonds during the business panel curated by Amanda Bell. The MAJOR KEY we learned during this panel was how you should never be afraid to share your resources. Sharing only brings more blessings your way. And if you're afraid someone may steal your ideas, keep this thought in mind; if God has given you a vision to carry, no one else will carry as great as you. Stacey Flowers, blew us away with her session, God Wants You to Be Happy. How do you get to a place of true HAPPINESS?? Well according to Stacey, TRUSTING God through your season of rest. Many women don't know when or how to rest. There is fear in taking time to just pause from everything. We learned through Stacey's testimony that not taking moments to rest can lead to a downward spiral of anxiety and depression. This session was one of the most talked about sessions of the conference. You can watch the LIVE recording HERE. And last but definitely not least Jada Edwards reminded us that we must hate sin. It was a tough message to chew, but it was much needed especially because we live in a world that tries to give half truth when it comes to God's word. The #WOPConference17 ended with an incredible, exclusive evening with the speakers of the conference. Jessica invited all VIP attendees to sit and dine at her special table with her favorite influencers and let's just say it was a night to remember. You can check out the photos below and REGISTER for the Woman of Purpose Conference 2018. What did women have to say about the Woman of Purpose Conference 2017? "I loved the Conference. God’s hand was truly on every piece of the conference. Hearing the speakers share their personal testimonies both the good and the bad was so encouraging! I loved how everyone was so personable. I literally broke down during praise and worship and a few of the speeches. Learning to reinvent yourself and create a new name without forgetting who we were and the things God has brought us through was right on time. I had been experiencing some pretty low times and God knew I needed this conference more than I knew myself. So grateful for Women of Purpose for being open and willing to follow their calling." "The experience I had at your conference was unlike any other. Myself and my small group attended and I knew several women who attended as well as volunteered. The stories that were shared resonated so deeply and encouraged me beyond words. I worshiped like I had never worshiped before, cried so hard that my head hurt and made plans for myself personally, spiritually and professionally. I have NEVER attended a conference so filled with Black Girl Magic. So many successful black women together in one place, celebrating each other, gleaning from each other and pouring into each other. My life was truly changed in those two days. I can't say enough good things about it." "The amazing women from the greeters to the speakers was like nothing I have experienced after living in Dallas for 9 years. My soul is now connected to my spirit, God-given abilities, confidence and belief in myself." Father in the name of Jesus, we pray for whomever is reading this right now. We pray for their heart, soul and mind and that you would give them all the tools, resources, and strategy needed for 2019. We pray that they would seek you day and night. We thank you that they will pray to you and prepare with you for the new year ahead. In Jesus Name, Amen. - Next week Tuesday, December 11th marks 21 Days before the year of 2018 comes to end. My question to you is how are you PRAYERFULLY PREPARING for 2019? - We all write down our dreams, goals, plans, where we want to be financially and all that good stuff. But have you consulted with the MOST HIGH and handed it all to HIM? - A big lesson I learned this year is I have a lot of dreams and many plans, but those dreams and plans mean absolutely nothing without strategy and execution and PRAYER. To get the road map to success it takes plenty of chatting with God. - Proverbs 19:21 says, “Many are the plans in a person’s heart, but it is the LORD’s Purpose that prevails. In order for the Lord’s purpose to prevail in our lives, we have a part to play. We have to seek HIM about everything with all our hearts, with all our souls and with all our mind! - We put together a 21 Day Prayer Challenge to get our minds set, hearts ready and prepared for us to have a blessed and spirit filled 2019. Our purpose in doing this is to help many of you do the following: ✔️Gain clarity about your 2019 and what you should be focused on. ✔️Receive revelation on next steps on life goals. ✔️Peace and understanding about your purpose. ✔️Exercise spending time with God daily and make it part of your lifestyle. ✔️Gain the strategies and wisdom to be ready for 2019 by seeking God wholeheartedly. ✔️Accountability to pray daily. - We’re asking 100 of you to join us on this challenge! You can grab your copy by clicking 🔗 in bio @womanofpurposenetwork and hit the It’s only $17 (less than what you spend eating out in a day) so why not use a few bucks on something that’s going to help you PRAY! - Can’t wait for us to all get started next week! Drop a 🙋🏽‍♀️🙋🏽‍♀️🙋🏽‍♀️ if you want to join the challenge. © 2017 Woman of Purpose - All Rights Reserved.